And to be completely honest, I’m not sure I have good answers to this set of questions. By the traditional metric of publishing, my grad school years have been a dismal failure: The only publication I have to date is a five-author paper all the way back from the summer of 2014 to which I didn’t even contribute that much. My two main research projects since then have been slow; the first is still in the review process, and the second has yet to produce a paper yet. This is especially frustrating because I chose to do math research in particular (as opposed to pursuing my other undergrad major, chemistry) for two main reasons: because I thought I was good at it and because math research seemed to proceed faster, at the speed of thought rather than the speed of experiment. What I found, as I’ve recounted before, is that the hard part of math research is actually the challenge of finding a good problem, and I’m neither good nor fast at that. This isn’t to say that my grad school years have been completely devoid of personal development; I did get married, for one. But maybe these aren’t the questions I should be asking in the first place. To approach the last six years of my life by asking merely, “How did it advance my resume?” is to view MIT as merely a dispenser of goods and services, a stepping-stone on the path to my own glorification. Christians, what does it mean to follow Jesus for you? What is he calling you to? Since 2010, I’ve discerned God’s calling on my life to be a life of service. God might very well call others to take positions of worldly authority and influence (like professorships) and use that status to be ambassadors for Christ. But based on my abilities and inclinations, it seems clear to me that I’m called to a life primarily of service, loving God and others in my community by serving them. So instead of reflecting on my lack of publications, I’ve been encouraged to reflect on all of the ways that I’ve been able to serve here at MIT. This is most on my mind right now as I debrief the MIT Integration Bee, which took place last night and which I’ve been leading for the past three years. This year, several of the other volunteers were busier than usual, so I ended up having to come up with nearly half of the integrals in the competition on top of doing most of the organizing work. And in the end, it turned out great. After the finals finished, several of the students who competed stayed afterwards to talk about the integrals they had failed to solve. It was pretty cool seeing a bunch of math and physics majors nerding out over integrals, and really validated much of the work that we’d put in to make the bee happen. 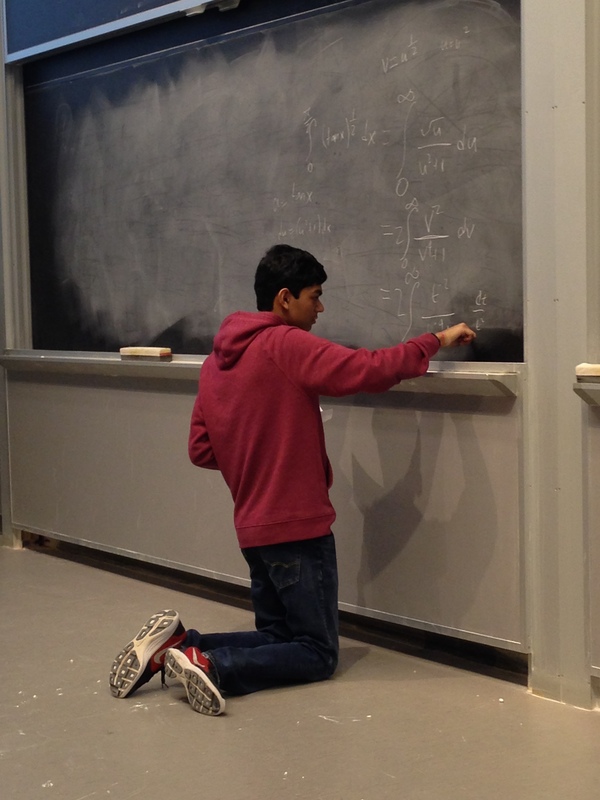 Integration Bee Winner (“Grand Integrator”) Ashwin Sah kneels down to get a better angle at the board in the midst of successfully finding the integral of sqrt(tan x) from 0 to pi/2 in the finals. Reflecting, I think back to the moment in December 2015 when the previous organizer Alex Moll reached out to me asking if I’d be interested in helping “run and/or organize” the bee. I took a few days to reply, but eventually responded to the invitation, saying that I’d love to help organize the logistics. Alex assured me that six other people said they’d help, but as we learned later on in January, only half of them would actually get involved at all. As the need seemed to grow, I stepped up more and more, not only taking over the competition that year, but also remaking it in ways that I thought would make it more exciting. I added a “playoffs” between the top 8 competitors to give the competition some finality, and introduced a Google Sheets-based organization scheme for collecting and selecting integrals to use in the competition. Not everything worked out; my dreams of compiling an epic video of the entire competition were dashed against the difficulties of getting started editing video after the fact. But nevertheless, in the past three years, I’ve developed a hopefully foolproof system for running the bee long into the future. And this week, as I was running around taking care of the last of the details of the bee, from getting food for organizers to printing the integrals we’d come up with, I’ve been writing all of it down in a handbook for future organizers. Pax Turner, one of my most consistent volunteers the last two years, is planning to take over the bee next year, and I’m sure he’ll do great, but it always helps to be able to pass on best practices to all future leaders down the line. This progression has repeated itself numerous times over the course of my time at MIT. My first year, I was asked by a couple of older graduate students to revive an applied math graduate student seminar called SPAMS that I’d never even attended. I said yes, and took the seminar to barely existing to competing with the pure math seminar in attendance in less than a year. Again, some of my new ideas, like prizes and feedback forms, didn’t end up lasting beyond my three semesters leading. But the seminar is still running, and providing an opportunity for the applied mathematicians in the department to build community together. Then there’s the Veritas Forum, which my friend Mark Ku heavily encouraged me to get involved with my first year, and which I ended up stepping up to coordinate the following three years. Or the Graduate Christian Fellowship, for which I coordinated weekly large group meetings over the course of three years, even reluctantly agreeing to serve as president and large group coordinator for a year. Or the softball league that I agreed to help organize the schedule for last year, which ballooned into effectively doing most of the work to run the league. And then there’s my church, where I’ve stepped up to serve in so many different ways — running slides, welcoming newcomers, teaching kids, taking minutes, counting offering, depositing offering, leading small group, organizing games — that the biggest challenge is making sure I’m still growing and learning spiritually myself in the midst of it all. And yet, in none of these cases with any of these groups did I ever specifically initiate asking how I could take on that opportunity. Instead, the opportunities came to me, and I, at times reluctantly, agreed to help. I don’t want to sound slighted, but this pattern suggests to me a deficiency in the culture of a place like MIT or Boston. Despite having tons of highly competent individuals, there’s a general lack of people willing to serve the communities around them, and the same people end up doing nearly all of this sustaining, cultivating work. I think of my friend Nicholas Triantafillou, who has served as the president of our dorm Sidney-Pacific, as well as on a wide variety of committees for the graduate student body. Nevertheless, despite doing so much already, Nicholas responded to my call for help on the bee, writing over a dozen integrals that we used in the competition and helping to grade the qualifier. Or then there’s my friend Boris Braverman, another former president of SP, who I also saw volunteer for the Career Fair and serve on a housing committee as part of the Graduate Student Council, all while regularly serving fellow grad students through the SP community. On a higher level, I think of Mike Sipser, the longtime math department head who agreed to become the Dean of Science at MIT, leaving the department bouncing between reluctant interim heads for years now. Jobs like those are often thankless and come at the expense of getting one’s own research done. When it comes to our community, MIT seems to be even more skewed than the old proverb of 20% of people doing 80% of the work. In this way, we’re somewhat the opposite of Leslie Knope of Parks and Rec, the Deputy Director of Parks and Recreation in Pawnee, Indiana. Knope frequently stands at deliberate and often comical odds with her environment: She hopes to move up from her position in local government all the way to becoming the first female president of the United States, but currently works an often mundane job supporting the community of a small Midwestern town. She’s abnormally ambitious given that her job is to serve her community, while we’re abnormally focused on serving our community given our jobs as graduate students are more often meant for fulfilling ambition. In the Christmas classic It’s a Wonderful Life, George Bailey is depressed after losing $8000 due to his uncle’s mistake and facing potential jail time, and confesses to the angel Clarence that he wishes he’d never been born. In a less dramatic but analogous way, sometimes I wonder whether I should have even come to grad school at MIT in the first place. And just as Clarence shows George what a wonderful life he’d lived through illustrating how it would have turned out if he hadn’t lived it, so I, too, wonder how this world that I’ve come to love would be different without me. Would GCF still be a thriving community? Would SPAMS, the Integration Bee, the Veritas Forum at MIT, or the Boston Metro Church Softball League still exist at all? Living a life of service isn’t easy. Some people seem to think it’s a problem that I “can’t say no” when there’s a need. And sure, we should all count the cost of our service and make sure we can afford it. It’s certainly a problem if I were to promise more than I can deliver, or if I’m just agreeing to help in order to impress someone. But let’s not discourage people from seeing needs and filling them out of love. The helpers need all the help they can get. As is, we as a society only seem to cherish the brilliant inventors, groundbreaking artists and startup founders, the Elon Musks of the world. This is why all of the major protagonists in the Harry Potter books are in Gryffindor, the house of the heroic and brave. We lack the cultural imagination to truly cherish someone from Hufflepuff, the house of the caring and compassionate. And this lack of cultural imagination leaves the thankless jobs in our communities falling by the wayside, even with all the advantages of technology and education that make them easier. On a broader scale, it leaves the big institutions of the world, from government to business, deprived of talent, furthering their sclerosis.